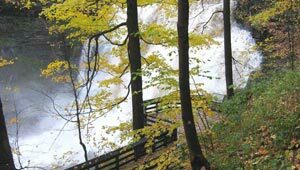 A short drive from Cleveland and Akron, the Cuyahoga Valley National Park conserves the Cuyahoga River valley and historic canal and railroad corridors in Summit and Cuyahoga counties. The park is a major year-round outdoor-recreation attraction in Northeast Ohio with over 3 million visits each year. With the assistance of Cleveland businesses and foundations, in 1978 TPL began securing lands for eventual federal ownership. In thirty years, TPL has completed more than twenty acquisitions for the park—from single lots to small farms to historic inns and businesses.